Rhino Ridge Safari Lodge offers a choice of fashionably luxurious safari accommodation in the Big Five Hluhluwe iMfolozi Park, the oldest of Southern Africa’s proclaimed game reserves. Couples, families and honeymooners are all well provided for in Safari Rooms, Family Suites, expansive Luxury Bush Villas and secluded Honeymoon Villas. Safari drives take place twice daily in open 4 x 4 vehicles, and guided bush walks are available on request. Spa treatments and cultural tours complete a wonderful experience amid spectacular scenery. ONE FREE NIGHT 2018 / 2019: Spend 4 nights at this wonderful safari lodge and the last one is free, inclusive of game drives and meals. Subject to availability and valid for travel during May and June in 2018 and 2019. 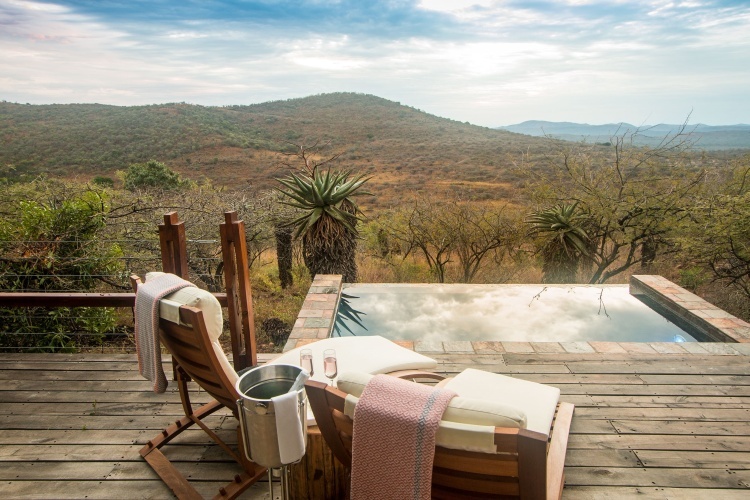 3-NIGHT SPA PACKAGE: R9390-00 includes 3 nights of luxury accommodation in a Safari Room, plus all meals, 4 game drives and 2 mornings of spa treatments including: full body exfoliation, 30-minute hot stone back, neck and shoulder massage, express pedicure, express facial and hydrating manicure. Subject to availability and valid for travel 01 January - 30 April 2019. At Rhino Ridge there is a conference facility accommodating 36 people. An overhead projector and whiteboard are available for use.